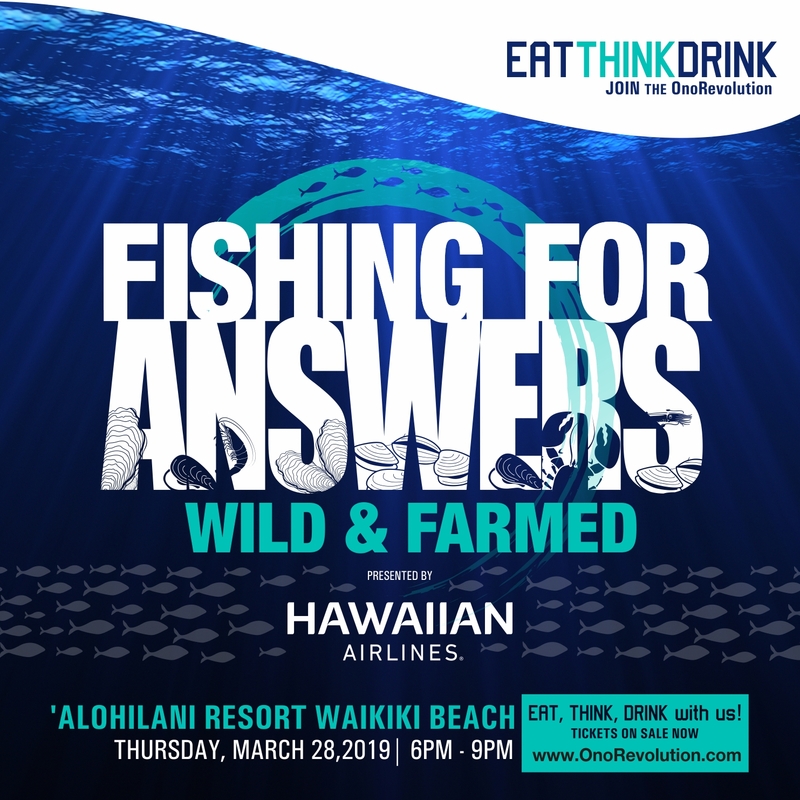 On Thursday, March 28, 2019 at ‘Alohilani Resort Waikiki Beach, EAT THINK DRINK: Fishing for Answers – Wild & Farmed brought together thought-leaders in the fishing industry to share their methods of catch, farm practices, and other approaches to help consumers learn more about their seafood choices. Click here for a podcast of the full keynote presentation, panel discussion and audience Q&A. Scaling Up—Small Farm to Big Farm featured keynote speaker Eric Pond, co-owner of Greenleaf Farm Management in Oregon, and panelists Fred Lau from Mari’s Gardens, Dana Shapiro from Hawaiʻi ʻUlu Cooperative, and Janel Yanamoto from GoFarm Hawaiʻi, and was moderated by Kamuela Enos from MAʻO Organic Farms. Following a fascinating hour of conversation on what farming and ag businesses need to scale up and expand their business operations, guests continued the dialogue and networked on the pool deck at Swell Bar while enjoying delectably crafted dishes by Morimoto Asia and Momosan in Waikiki, 12th Ave Grill, Poke Stop, ’Alohilani Resort, and La Tour Café, plus a selection of wine and craft beer from Southern Glazer’s Wine & Spirits. Hawaiʻi is a grower’s paradise, boasting nutrient-rich soil, a consistent year-round climate and an extensive history in self-sustainable farming. 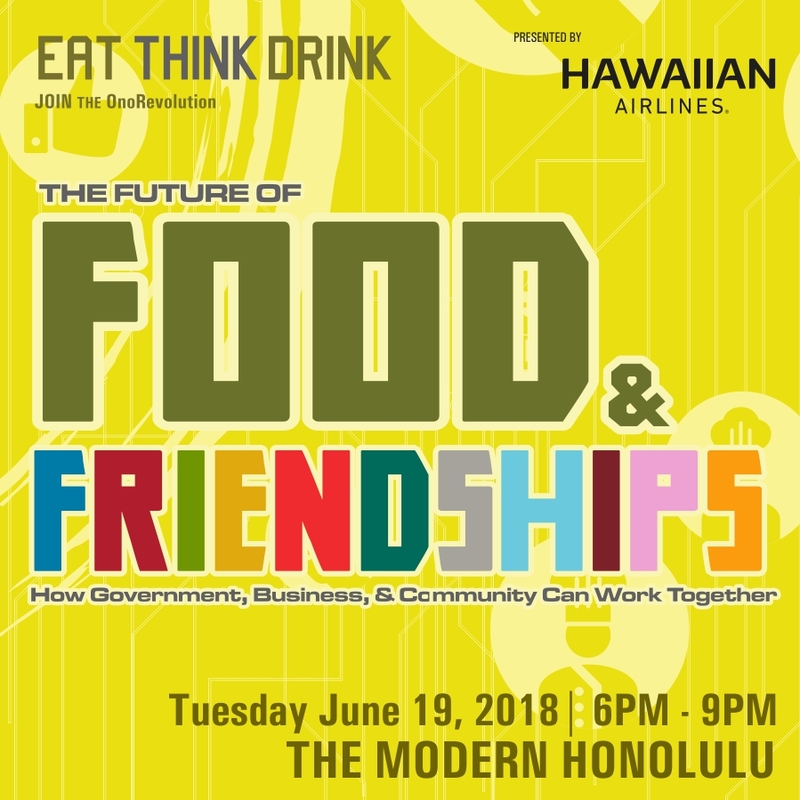 On Tuesday, June 19, 2018 at THE MODERN HONOLULU, EAT THINK DRINK: The Future of Food & Friendships brought leading minds together to spark a conversation on the unparalleled opportunity the next generation has to revive our islands’ food independence. Keynote Speaker Senator Donavan Dela Cruz kicked off the evening by giving an insider’s look at the vision behind the Whitmore Project, an active and comprehensive plan to revitalize Central Oʻahu’s agricultural landscape and economic footprint. As one of the most isolated archipelagos in the world, Hawaiʻi must work hard to protect and preserve its fragile ecosystems and limited natural resources. However, as today’s consumer society continues to place emphasis on convenience, our Islands’ environment and communities are becoming more and more at-risk. 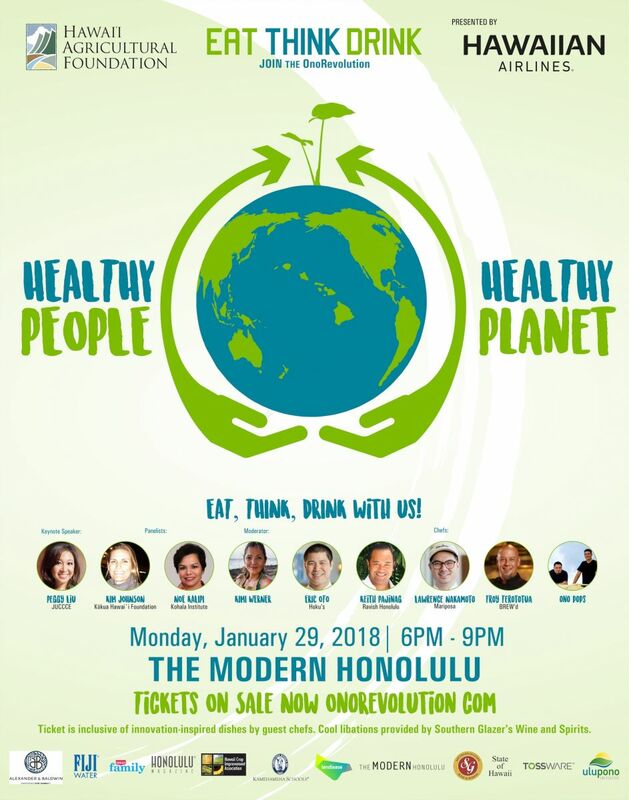 On Monday, January 29, from 6-9 p.m. at THE MODERN HONOLULU, EAT THINK DRINK: Healthy People, Healthy Planet presented by Hawaiian Airlines gathered innovative minds to lead a conversation on the symbiotic relationship between wellness and sustainability. The evening was kicked with an inspiring talk by Keynote Speaker Peggy Liu, chairperson of JUCCCE, an internationally-recognized nonprofit dedicated to building a greener China, and one of the world’s leading minds in sustainability and cross-cultural collaboration. Afterward, the conversation was moderated by Kimi Werner, a U.S. National Spearfishing Champion, a globally-renowned advocate for sustainable food systems and an ambassador of Patagonia Provisions. Featured panellists included Kim Johnson of the Kōkua Hawaiʻi Foundation and Noelani Kalipi of the Kohala Institute. An inspiring group of prominent restaurateurs and investment experts joined forces to uncover what it takes to transform a local value-added product into the next big “Made in Hawaiʻi” food project. 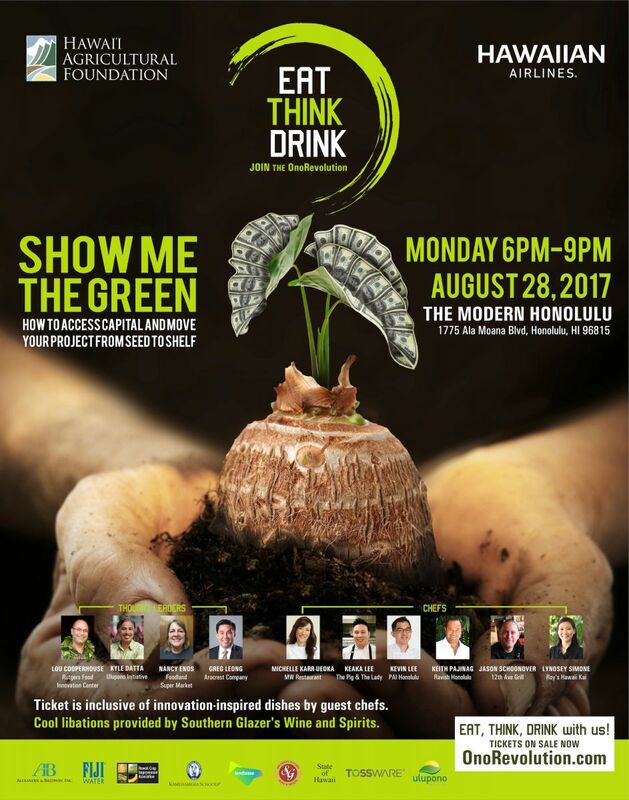 On Monday, Aug. 28 from 6 to 9 p.m. at THE MODERN HONOLULU, the Hawaiʻi Agricultural Foundation hosted five industry leaders and six of Honolulu’s hottest eateries for the third EAT THINK DRINK presented by Hawaiian Airlines, themed Show Me the Green–How to Access Capital and Move Your Project from Seed to Shelf. Show Me the Green started with a thought-provoking, TED-style talk delivered by Keynote Speaker Lou Cooperhouse, executive director of the Rutgers Food Innovation Center and globally-renowned pioneer in food business innovation, incubation, acceleration and industry cluster formation. Afterward, a curated mix of business leaders contributed to a multifaceted conversation on food innovation and what makes a small product made with a locally grown or raised crop appear worthy to national investors. The panel was moderated by Meli James of the Hawaiʻi Venture Capital Association and include Kyle Datta of Ulupono Initiative, Greg Leong of Arocrest Company and Nancy Enos of Foodland Super Market. At the conclusion of the panel discussion, guests engaged in continued fellowship over an interactive dine-around featuring six notable tastemakers, including Keaka Lee of The Pig & The Lady, Jason Schoonover of 12th Ave Grill, Kevin Lee of PAI Honolulu, Keith Pajinag of Ravish Honolulu, Michelle Karr-Ueoka of MW Restaurant and Lyndsey Simone of Roy’s Hawaii Kai. Click here for Lou Cooperhouse’s keynote presentation. 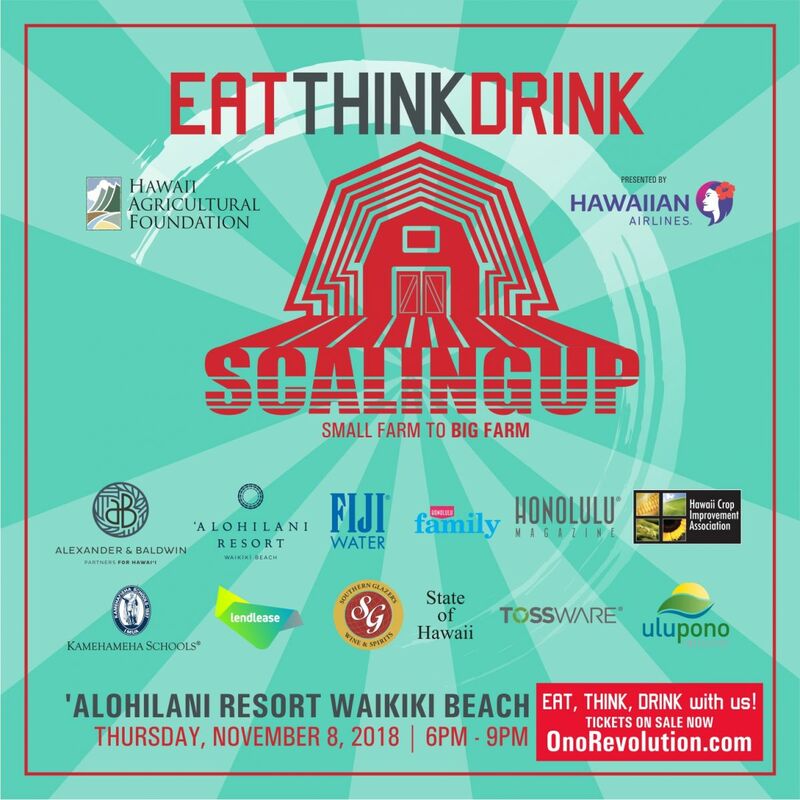 In April 2017, hundreds of local consumers in conversation and farm-fresh cuisine at the second EAT THINK DRINK presented by Hawaiian Airlines. 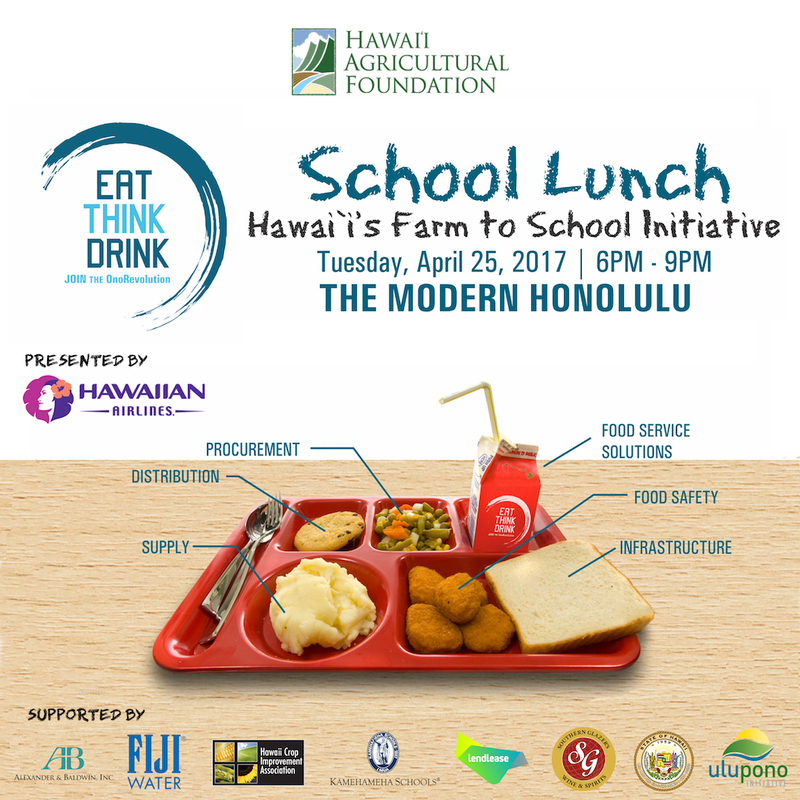 “School Lunch – Hawai‘i’s Farm to School Initiative” brought thought leaders and policy makers in agriculture together to share their knowledge, experience and views on food and education as they examine meals served in school cafeterias. School Lunch was lead by keynote speaker was Ann Cooper, a celebrated author, chef, educator and prominent national advocate for better school lunch programs. In addition to Cooper, a panel of local and national advocates working to increase the amount of locally-sourced food on school lunch plates took the stage. Featured speakers were Lieutenant Governor Shan Tsutsui, Dexter Kishida of the Hawaiʻi Department of Education’s Food Services, JuliAnna Arnett of the USDA Farm to School Program and Greg Christian of Beyond Green Sustainable Food Partners. After the panel discussion, guests had the chance to enjoy what an ideal school lunch would look like in the hands of four Hawaiʻi-based chefs: Ronnie Nasuti of Tiki’s Grill and Bar, Keith Pajinag of THE MODERN HONOLULU, Matt Young of Hula Grill and Randy Bangloy of Eating House 1849 at Kapolei Commons. 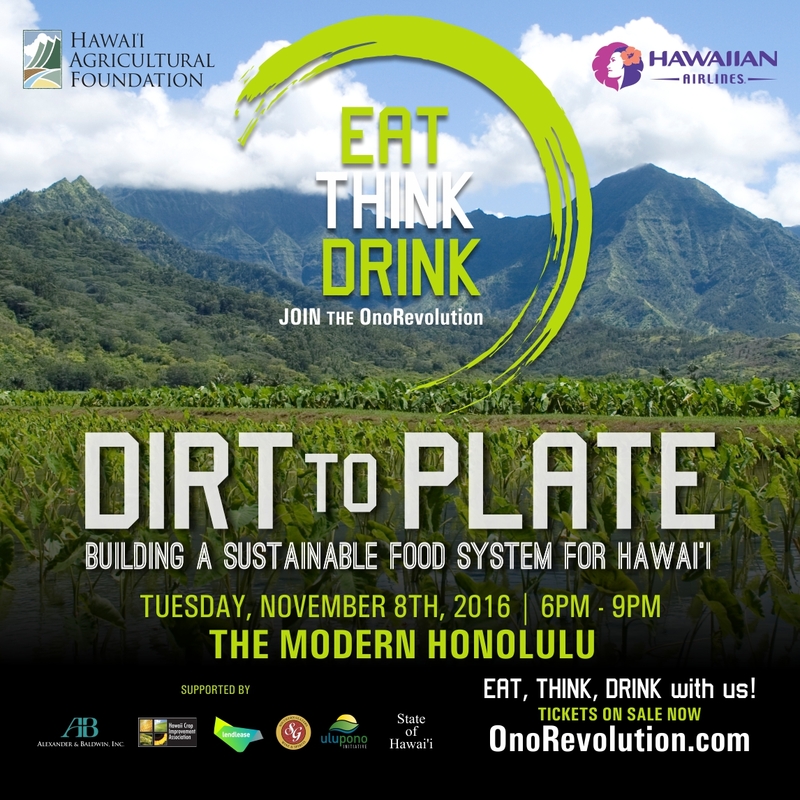 More than 280 persons spent election night discussing the opportunities and challenges of building a sustainable food system for Hawai‘i with the kickoff of EAT THINK DRINK. Featured speakers include Chef Michel Nischan, the 3-time James Beard award winner and food pioneer behind Wholesome Wave, John Martin of VICE Munchies fame, along with State Senator Donovan Dela Cruz, local farmers Alec Sou and Judah Lum and Wendy Akiyama of Armstrong Produce. EAT THINK DRINK examined building a sustainable food system from the perspective of the next generation of farmers, chefs, food buyers, community leaders and media. Five of Hawaiʻi’s most innovative and inspiring chefs will showcase their ag connections with Dirt to Plate dishes. HAF hopes to continue engaging and empowering communities with EAT THINK DRINK, a series of four events on food, agriculture and change. Participating chefs included Keith Pajinag of THE MODERN HONOLULU, Brandon Lee of Piggy Smalls, Lance Kosaka of Top of Waikiki, Robynne Maii of Fête and Chris Kajioka of Senia.